The Ruger LCP (Lightweight Compact Pistol) marks Ruger’s first major attempt at making a lightweight concealed carry pistol in .380ACP, and they work great in our Ruger LCP concealed carry holsters. The LCP might be the most common pocket pistol on the market. Although, it is neither the first nor the most well- known. In 2008, it emerged from the shadows to overtake the most popular .380 ACP pistol in the world, the Walther PPK. The LCP is indeed a formidable pocket carry pistol. It is a hammer-fired, locked breech, recoil operated, semi-automatic pistol. 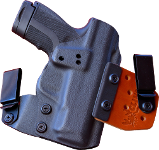 The LCP has an overall length of 5.16”, a height of 3.7”, and a width of three-quarters of an inch. The trigger pull on the LCP is about 6.5 pounds with a long, hard reset. While the LCP sells their tiny heater in droves, there are a few alternatives. For instance, the Springfield 911 and Sig P238 are about as small but have heavier, metal alloy frames. Concealing the Springfield 911 is about as easy as concealing the LCP if you use good Springfield 911 holsters (you will notice the extra ounces of weight though). It is interesting that the Ruger logo is the mythological creature, the phoenix, with the signature ‘R’. Because like a phoenix rising from the ashes, in 2016 the Ruger LCP II was released. It is a .380ACP single-action, semi-automatic pistol. Much to shooters’ relief, there are a few significant changes from the original. Poor Sights- Larger more prominent sights, but small enough to not hinder holstering. Heavy Trigger Pull- A new, integrated blade safety trigger design evolved from the LC9s. Hard to rack slide- Smooth slide, with front and rear serrations for press checks. Slide that does not lock to the rear following the last round- Remedied. The trigger weight of the LCP II is only 5 pounds, 11 ounces. A significant difference. The LCP II is slightly larger than the original at 5.17” long, 3.71” tall, and still three-quarters of an inch wide. The Ruger LCP is back with the LCP II! Ruger made a decent handgun (the LCP) much better by adding several improvements, especially the lighter, smoother trigger, to make the new LCP II an excellent addition to anyone’s concealed carry choice. It’s not recommended to just throw this in your pocket without a holster. Good Ruger LCP holsters are easy to find, including our LCP Kydex holsters.